How many bankers were jailed for their part in the financial crisis? It’s ten years since the credit crunch began, triggering the biggest global downturn since World War II. In the UK, 1.3 million people were made redundant between 2007 and 2010, and we’re still £30 a week worse off on average than we were before the crash. Across the pond, unemployment in America rose from 4.7 per cent in September 2007 to 10 per cent just two years later. It wasn’t until 2016 that the US jobless rate returned to pre-crisis levels. The sale of “subprime” mortgages is often considered to be the main cause of the crisis (it’s explained in more detail here). A number of individuals and banks have been accused of fraudulently fixing the London Interbank Offered Rate (LIBOR) in the run up to and during the crisis. LIBOR affects how much banks pay to borrow money from each other. But what happened to the banks and bankers at the heart of the crisis? And how many were prosecuted for their part in the crash? Who’s been prosecuted in the UK? The UK’s Serious Fraud Office (SFO) have brought charges against 13 people as part of their investigations into LIBOR-rigging. 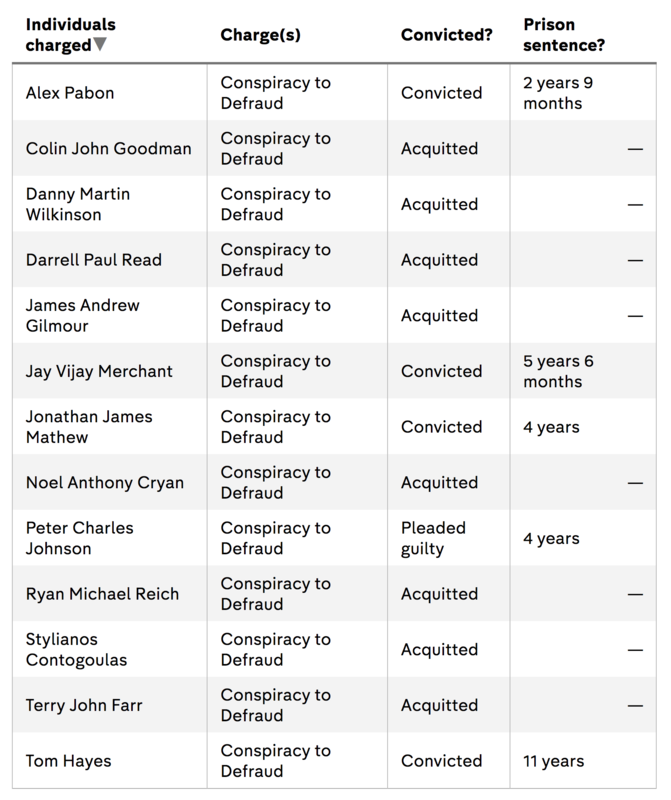 Of those, eight have been acquitted, four have been found guilty, and one pleaded guilty. In 2017, Tom Hayes, Jay Merchant and Jonathan Mathew all asked the Criminal Cases Review Commission to look at their cases. The SFO have also charged eleven people with allegedly rigging EURIBOR, the Eurozone’s equivalent of LIBOR. Christian Bittar, Achim Kramer, Colin Bermingham, Carlo Palombo, Philippe Moryoussef, and Sisse Bohart will all stand trial in January 2018 for conspiracy to defraud. The SFO has also secured European Arrest Warrants against Andreas Hauschild, Joerg Vogt, Ardalan Gharagozlou, Kair-Uew Kappauf, and Stephane Esper for charges in the EURIBOR case. Four individuals and Barclays bank itself face charges relating to Barclays’ capital raising exercises in 2008. At the time, Barclays raised money through deals with Qatar to help the bank avoid the need for a government bailout. The trial will begin in January 2019. The US authorities have gone much further than their British counterparts. American investigations have reached beyond the LIBOR scandal to include mortgage mis-selling, which is widely considered to be the biggest single cause of the financial crash. US authorities have also tackled the alleged misuse of bailout money. In January this year, a former trader at Barclays and BNP Paribas pleaded guilty in a New York court to conspiring to fix prices in the foreign exchange market. And in June, three former traders from the UK travelled to the US to face criminal charges over LIBOR. Two British former traders at Rabobank who had been convicted in the US for LIBOR rigging have since had their convictions overturned. And US authorities have taken action against banks as well as bankers. In March 2014, 16 global banks (including Deutsche Bank, Barclays, Lloyds Group, RBS Group, and Rabobank) and the British Bankers’ Association trade group were sued by the US authorities for alleged LIBOR manipulation. According to Professor Brandon L. Garrett from the University of Virginia School of Law, 2015 saw 80 banks finalise criminal settlements with US prosecutors. High-profile cases against alleged mortgage mis-selling include multibillion dollar payouts from Deutsche Bank and Credit Suisse, who settled a combined total of nearly $13 billion with the US Department of Justice in December 2016. Earlier this year, Royal Bank of Scotland said it would pay £4.2 billion to settle claims it mis-sold billions of dollars’ worth of subprime mortgages to US mortgage lenders Fannie Mae and Freddie Mac, which had to be bailed out in 2008. Meanwhile, Barclays said in December that it would fight a civil case brought against it by the US authorities rather than pay an out-of-court settlement. US authorities are also looking at what happened to the money the government provided to bail out ailing banks once the crisis was underway. The US government set up the Troubled Asset Relief Program (TARP) in October 2008 to buy toxic assets from financial institutions – initially injecting $700 billion into the market. But within a few years, some analysts had started to raise concerns that the TARP money wasn’t being used for its intended purposes. The office of the Special Inspector General for the Troubled Asset Relief Program (SIGTARP) began looking at alleged misuse of funds. 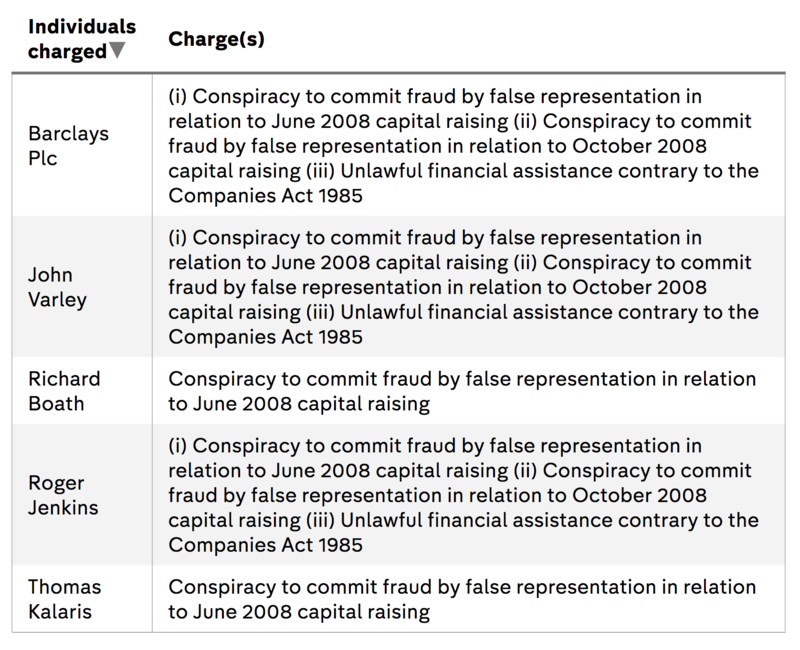 402 individuals facing criminal charges, including 97 bankers charged with fraud. Wall Street traders were also charged. 324 people being convicted, of whom 222 were sentenced to prison. It is of course important to convict the Creator’s of bad money. But what are the systemic changes that have been brought about in the capitalist system when it was proved by the crisis that markets can’t can correct themselves. Same old wall street and banks enjoying hefty pays and bonuses for creating the crisis. The system has not learnt anything from the crisis perhaps. I’m curious where you obtained the prosecution & conviction data for the US. The perception over here is the Govt went after bit players, rather than the big crooks. To my knowledge, there were no indictments against any ‘brand-name’ execs. Furthermore, our Govt allows serial law-breakers to continue to operate (both HSBC & Wells Fargo come to mind) after merely paying fines–some of which are only minor fractions of the revenue generated by the scam. Finally, the biggest ‘catch’ (in terms of headlines, at least) from that era was arguably Bernie Madoff and his Ponzi scheme. And, rather than being accosted thru diligent investigative work and prosecutorial zeal, he was turned in by his own sons!